Learn about Ketchikan’s Native customs and traditions with our Native tour guides! PADDLE UP HISTORIC CREEK STREET Join us for a historical canoe journey up Ketchikan Creek in our 36-foot Native Canoe with our resident Native Guide.You will paddle from Thomas Basin up Ketchikan Creek and view Ketchikan’s most popular tourist destination from the water as the Tlingit residents and bootleggers did around the turn of the century. You may catch a glance of an Eagle, a kingfisher or a salmon (July- August) or our resident harbor seals. The creek is Ketchikan’s main spawning stream for four species of salmon. The history of Creek Street is long and colorful. The Tlingit’s used Ketchikan Creek as a summer fish camp that later became their residence when frontiersmen began occupying Ketchikan.It was known as Ketchikan’s Red Light District in the 1920’s. During the pioneering gold rush heyday, there were up to 20 bordellos to cater to the fisherman, bootleggers and gold miners to name a few. The most famous of these bordellos is Dolly’s House, which is now a museum. Your guide will point out all these historic features. After your paddle you will disembark on a dock at the estuary and then you can stroll along the boardwalk to visit shops, art galleries and the historic Dolly’s House. End your tour at the Alaska Eagle Arts Gallery (#5 Creek Street) to pick up your Canoe Tee shirt designed by Marvin Oliver. 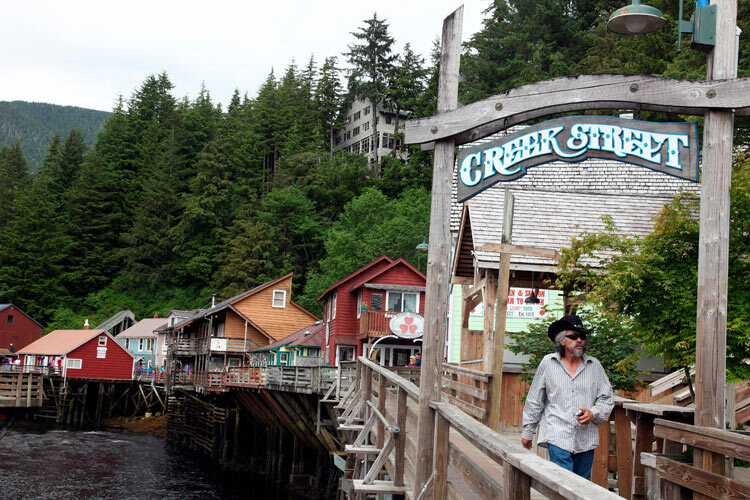 The Ketchikan Creek Street Canoe Journey is a must-see for anyone visiting the scenic town of Ketchikan. Also be sure to check out the infamous Married Man’s Trail and the famous Salmon Ladder while visiting Creek Street! Use Promo code: ACE2 when checking out. Pre-book your tour reservation between May 2019 – October 2019 and save! CANOE JOURNEY: To Infamous Creek Street! EXPERIENCE: Grab a paddle and sightsee through Thomas Basin and Creek Streetwith our Native guide. 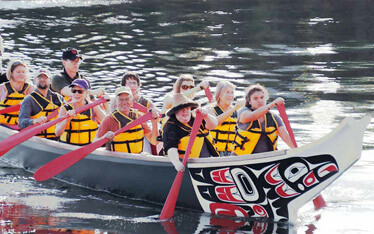 Make Alaska Canoe Experience the centerpiece of your next vacation! With our Flextime Guarantee, you’ll have complete “rescheduling flexibility”. 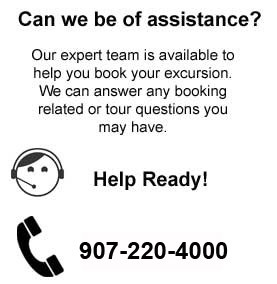 This allows you to first secure your tour, then make travel plans and accommodations to Ketchikan Alaska. Book your Native ACE tour today. For a truly amazing experience of a lifetime! OFF SEASON TOURS / CUSTOM TOURS : Available upon request! Children under 12 are free! One child per adult.